Kitty is the child of an unhappy marriage. Although removed from reality by being sent away to boarding school, she is nevertheless always aware of the destruction that is being wrought at home; instinctively she fights to defend the weaker, the well-loved partner, aware always of her own weakness and inadequacy. It is a fight which she is doomed to lose and the story unfolds with a tragic sense of inevitability. It is nonetheless a very funny story with scenes of high comedy. Kitty has a great sense of the ridiculous; her humour and self-awareness are as moving as the tragedy in which she finds herself. There is irony as well as pathos in the contrast between the self-interest and hypocrisy of the grown-ups and the clear vision and passionate loyalty of the child. Margaret Bacon employs her remarkable gifts to explore the effects upon Kitty of an adult society which ignores her real needs even while paying them lip-service. In doing so she conveys with great insight and humour the lonely and often desperate world of the solitary adolescent. Kitty is a penetrating, utterly real study of the effects of an unhappy marriage on its two daughters. Kitty loves her gentle, agnostic father and hates the harsh mother who knows everyone’s vulnerable point and, merciless, inserts her knife. Margaret Bacon’s picture of Kitty at boarding school entertains as skilfully as Charles’s slow destruction agonises. She draws the Yorkshire dale where the Langdons live admirably, especially in snow. What of the other daughter, beautiful Gwendolen? Kind Arthur’s wife, mother of delicious twins – but is she Goneril to her father’s Lear? We leave Arthur to discover. ‘Kitty‘ is the story of an adolescent girl and the child of separated parents. Adoring her father and having little time for her strict, unfeeling mother, she leads a life of loneliness in a boarding school and joins in the mock domestic reunions at holiday time. Margaret Bacon has written a warm and emotional story, sad but not without humour, which reveals the drama of an unhappy marriage and the hypocrisy of adults as seen through the all-perceptive eyes of a child. 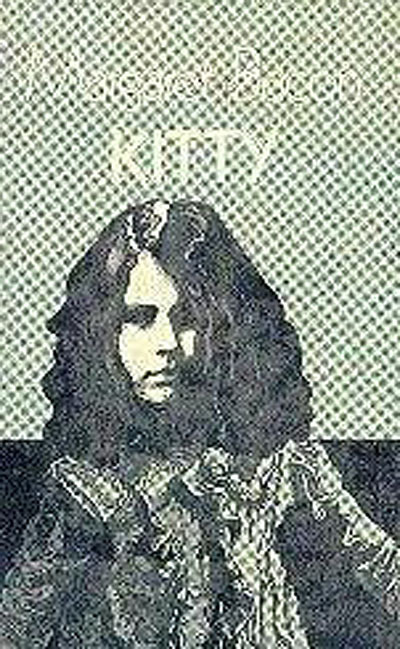 Kitty by Margaret Bacon is a moving record of a sensitive young girl appalled by adult hypocrisy. It unfolds the story of an unhappy marriage, yet it has scenes of high comedy. The childhood and adolescence of the pudgy, chilblained heroine are traced in convincing detail through her growing awareness of her mother’s vicious treachery and her father’s disastrous goodness. Kitty’s sadness, her sense of fun, her unspoken thoughts, and her immense unspoken hatred at the end are finely presented.